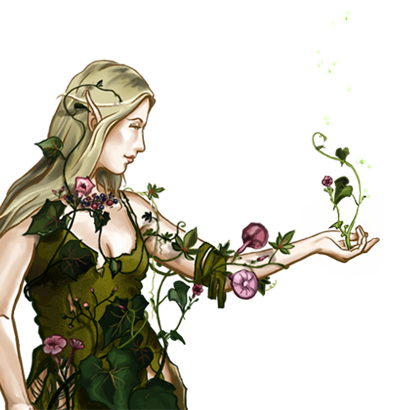 Dryads possess a closer affinity to their faerie nature than their brethren, yet at times exhibit a remarkable understanding of human nature. In fact, Dryads are more apt to engage the few travelers they meet in friendly conversation than seduce or murder them. Some elven scholars have proposed there exists a deeper connection between woodlandkind and humans as children of Earth; to many, this is unthinkable. For them, to even suggest such a connection between the violent, destructive humans and the ancient, illustrious elves constitutes heresy. If there are those among the faerie with knowledge of this world’s beginnings, they do not share it, preferring instead to lead peaceful, modest lives. Nonetheless, the Dryads’ calm nature in no way means they are powerless. Their extensive knowledge of nature and its magical arts makes them a formidable opponent in any conflict.